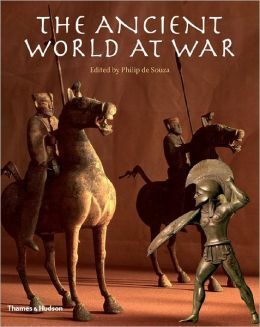 The last few copies of Philip de Souza ed., The Ancient World at War seem to have reached bookstores and are selling at a discount. My copy was well worth the reduced price. This book contains some good chapters and beautiful photos, although some of the ideas and illustrations are familiar from other books for beginners. Yet it also does something which other books do not; it covers the whole of the ancient world. While many books on “ancient warfare” follow a path from Egypt and Mesopotamia to Greece to Macedonia to Roman Italy, this volume has chapters on Gaul and Iberia, Central Asia, China, and even the civilizations of the New World. It seems to me that this is a better approach, because Greek and Roman soldiers were always in contact with foreigners and their ways of doing things. Narratives which only mention other cultures when they won or threatened to win great victories over Greeks, Macedonians, or Romans are exciting but misleading.